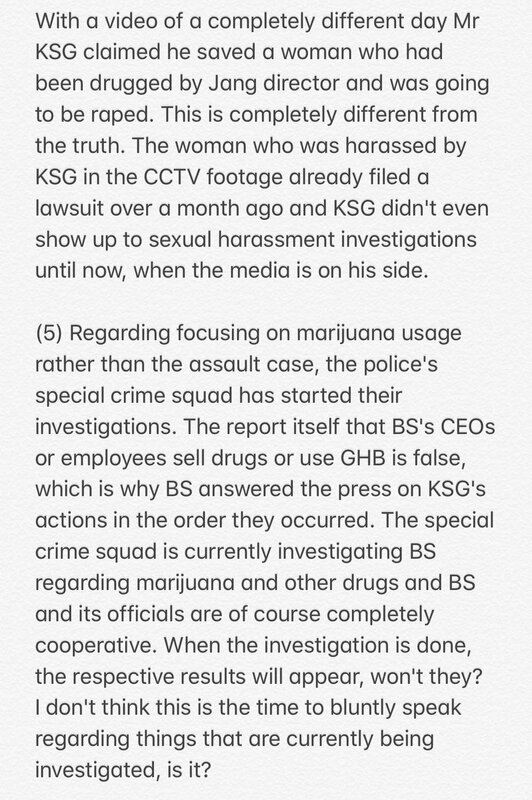 The back-and-forth of the Burning Sun controversy has been messy as hell, and it’s been hard to pin down what’s what when there’s so many accusations floating around and not much the way of reliable evidence. 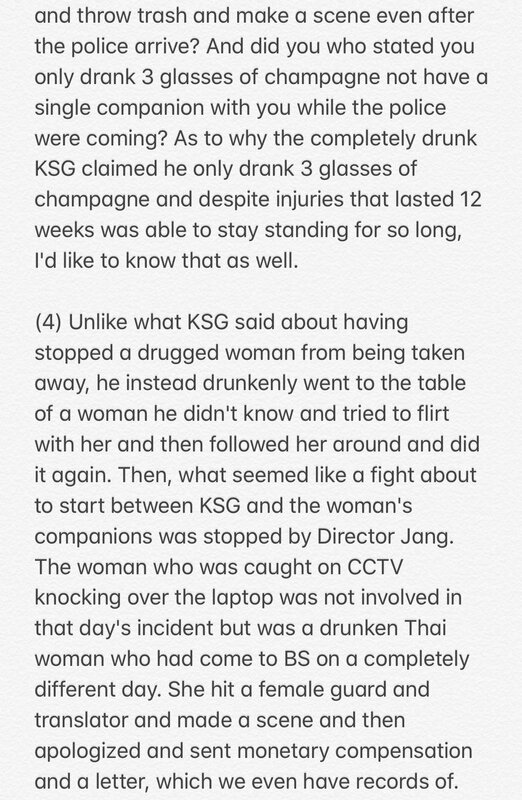 One consistent complaint has been Seungri not stepping forward to say anything about it, but earlier today he addressed it at length (read in full here). Basically, he apologized for not addressing it sooner, saying that he was advised that it might cause further misunderstanding. Honestly, his silence seems to have had that effect anyway. 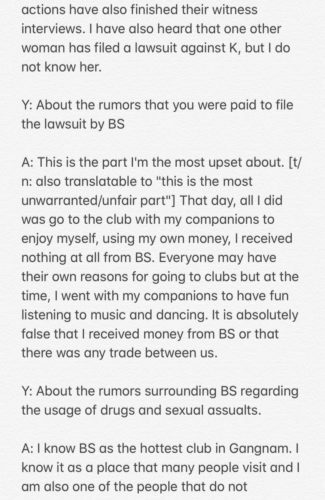 Regardless, Seungri reiterated that he was not there at the club at the time. Makes sense so far. He may well have been there for an event but left earlier than things went down as has been claimed, and nobody has really disputed that he wasn’t there so far. Also, it’s plausible that fights happen at clubs and he didn’t think it was a big deal. 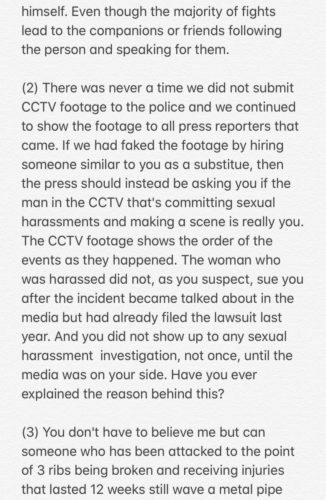 Seungri then apologizes to the assault victim for the incident, saying he had only seen it when this came out in the media. Importantly, he clarified his role with the club, going with what was previously claimed by a former employee that he’s primarily a figurehead. I first became involved with the club when BIGBANG briefly halted promotions and I began solo promotions. Using the time outside of my solo promotions, I began with the innocent mindset of wanting to try working as a DJ, which is something I had wanted to do, at a place where I could freely play music at any time. Just in time, I got a good opportunity to become the executive director in charge of promotions at a club. Since I’m a celebrity, I was in charge of publicly promoting the club. 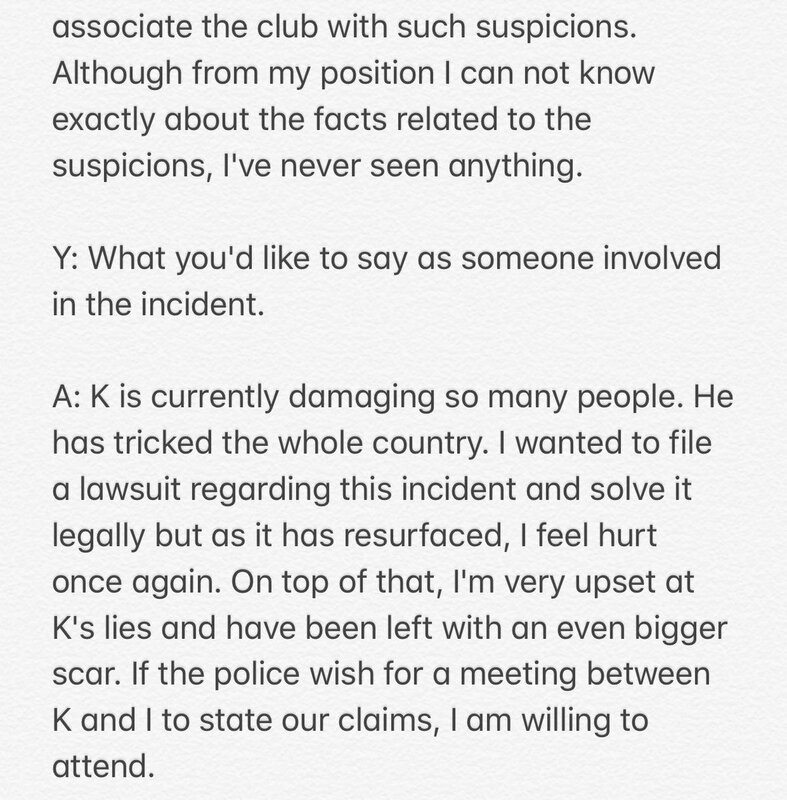 Operating and managing the club were not my roles, and I am reflecting and deeply apologize for not showing myself taking responsibility from the beginning of the incident, as I was not involved in these roles from the start. Honestly, that’s all fine, even if wiping his hands of this completely is unrealistic. 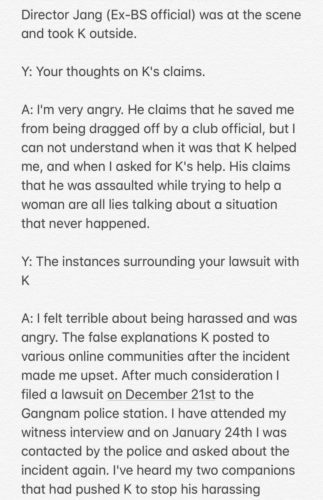 As I’ve said before, the assault incident is definitely ugly, but it’s a club and it really wasn’t too shocking for me, especially knowing what the victim is now accused of by women. But the important thing is what he addresses next in terms of drug involvement and those types of issues that were a lot more serious, and he says he has no knowledge of any of this happening. The issue that began with an assault case is now being covered with reports about drugs. 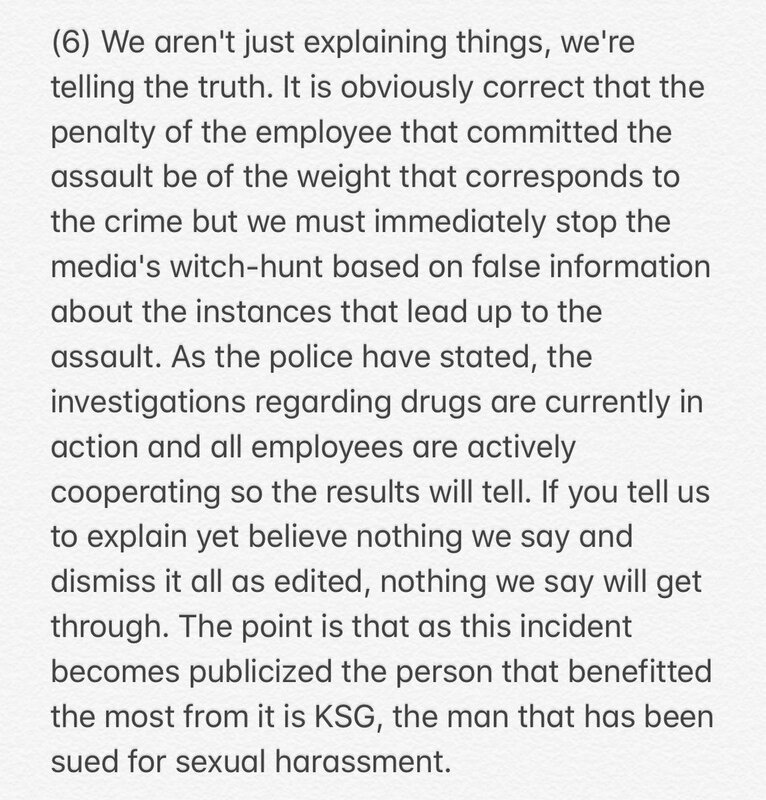 I have not seen or heard anything related to this, so I’ll actively cooperate with investigations and hope that strict punishment will be carried out if a crime is revealed through the investigation. I’ll also take full responsibility if there is something I need to be responsible for as an executive director at the time. 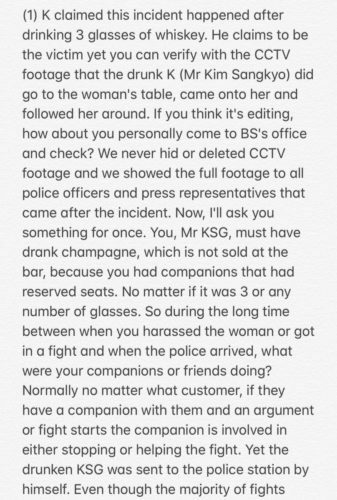 While going through this incident, I learned and realized a lot once more about the responsibility and attitude of a celebrity. I apologize once again to everyone for causing concern through this incident, and will work hard to become more mature and considerate. Honestly it doesn’t really clarify anything, he just says that he personally is unaware of it, which is possible. 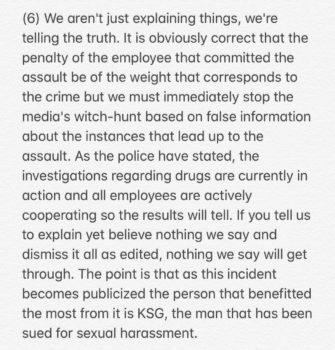 The most important thing is the bit about taking responsibility if the police find anything, because it’ll be hard for him to avoid backlash if some kind of drug distribution thing is going on or if the staff is involved in sexual assaults. After all, it’s hard to buy him distancing himself so far from the club to the extent people are saying, so ultimately it’ll come down to what is actually going on at the club and what he knew about it, if anything. So Seungri’s spoken out and it’s a quality statement, but it’s admittedly also not something likely to change anybody’s opinions. Other than that, the rest of the news hasn’t stopped coming either. 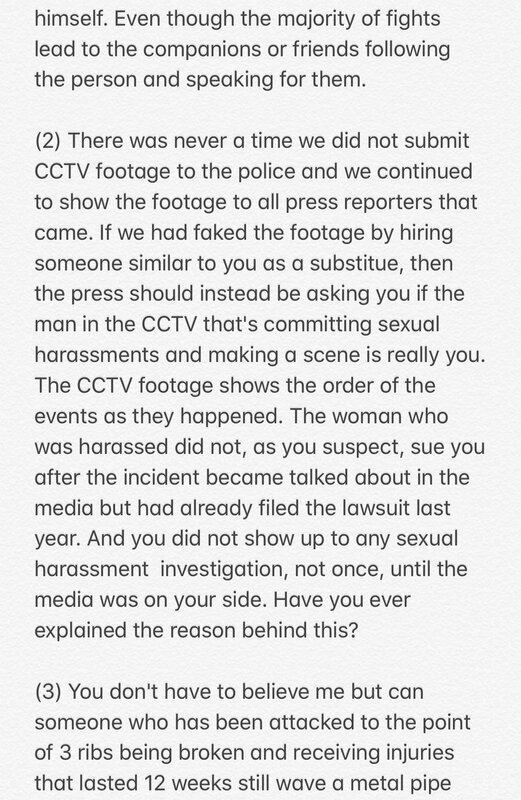 As mentioned yesterday, the assault victim had reportedly been accused by multiple women of sexual harassment, which runs counter to his story that he had been protecting a woman from sexual harassment. Well, now one of the women has spoken out, characterizing the assault victim as having fooled the nation. 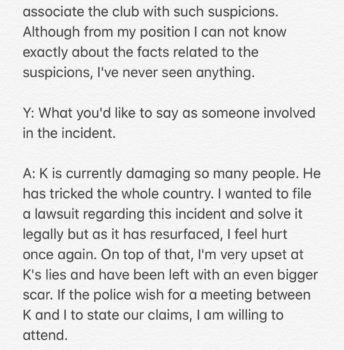 Furthermore, the club has responded directly to comments left on their Instagram, attempting to clarify accusations of editing the CCTV and drug use and what not. 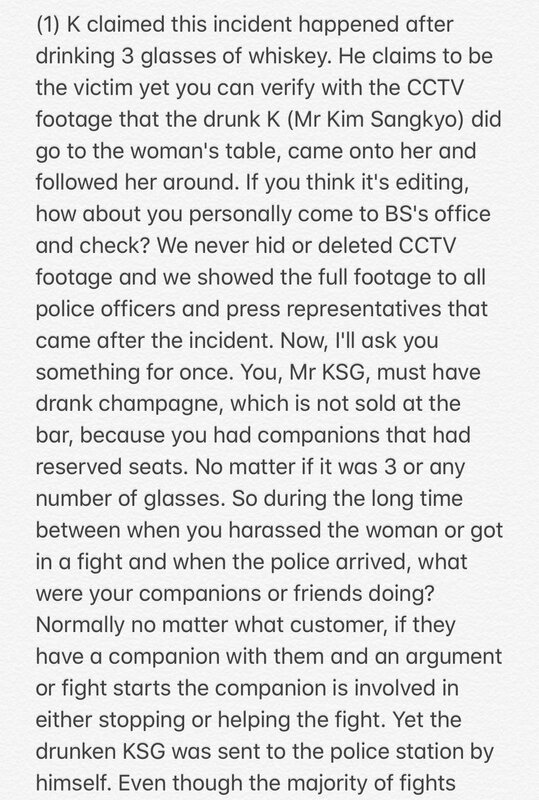 Also, the video that was shared by (among others) Seungri’s sister from yesterday has now been translated into English. 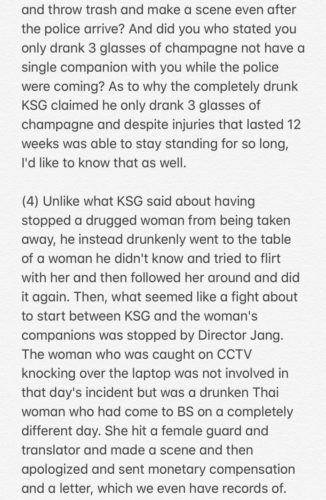 Alright, so what we know is that a man was assaulted using excessive force by security of Burning Sun, for which they have apologized and fired a director who was involved. 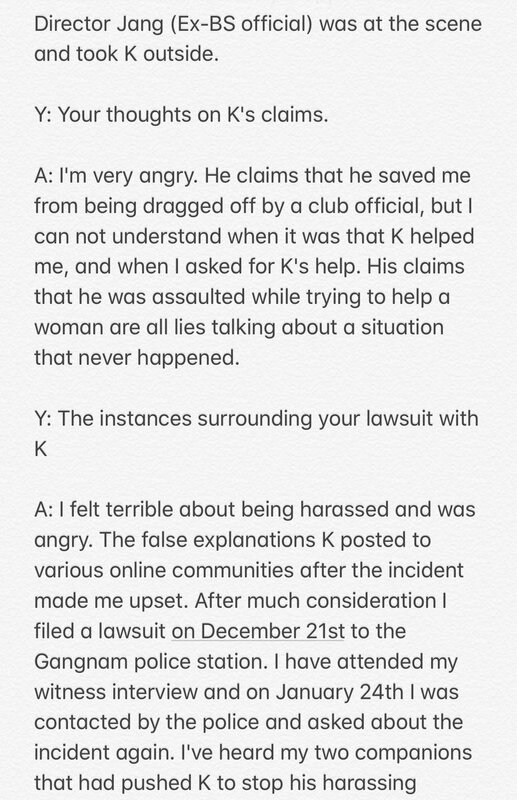 That assault victim also went on to accuse the club of rampant drug use and sexual assault, as well as bribing police, and he now is facing sexual harassment charges against him, as well as supposedly being influenced by a disgruntled former Burning Sun employee. 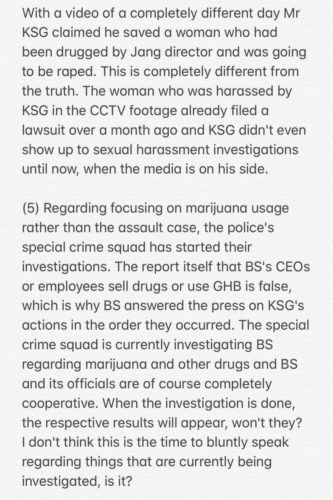 The club is also facing accusations from former and current employees of drug use in the VIP rooms and rampant sexual assault occurring, though the club hasn’t been implicated in the participation of that as of yet and police are in the midst of investigating those charges. As I said before, there’s such a wide possibility of outcomes that it seems irresponsible to jump to any conclusion at this point. 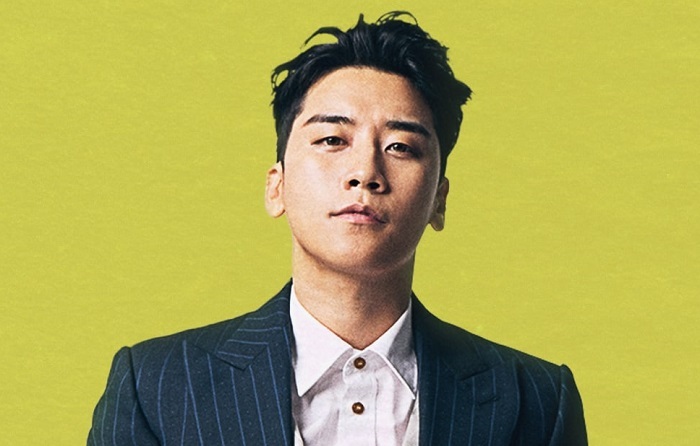 But now that the pendulum seems to be swinging back the other way towards the side of Seungri and Burning Sun, I feel it’s necessary to point out that rushing to exonerate him and the club while a police investigation into the actual serious charges is ongoing is as irrational as those who rushed to condemn them.